TOPEKA – Every year, the Kansas Highway Patrol hosts an informational booth at the Kansas State Fair. This year’s fair came after a few particularly difficult weeks for law enforcement, with several officers killed in the line of duty throughout the U.S.
During the fair, an unplanned event became a unique attraction and took center stage at the Patrol’s booth. On the first day of the fair, one kind act was all it took to get the momentum building for what became a touching and humbling time for KHP personnel, as well as those in other law enforcement agencies. Someone came into the booth and placed a Post-it note with a kind word of thanks on it. Word spread through social media, and more people came in to leave their notes, some even emailing words of support when they could not attend the fair. “I felt honored and humbled by the support the people of Kansas have shown for THEIR Highway Patrol,” said Technical Trooper Tod Hileman, KHP Public Resource Officer from the northwest Kansas area. The Patrol’s public resource officers from across the state, who staff the booth during the fair, had come prepared to talk to members of the public about traffic laws, car seats, buckling up, and other safety related items. They were also focused on recruiting new Kansas state troopers, however the focus of their days soon changed from providing information to talking about the job, hearing encouragement from the public, and in turn, thanking the public for their support. 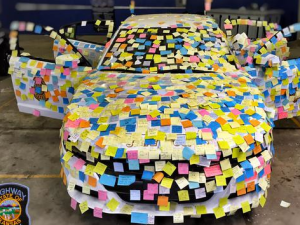 The Post-it note car became a topic of discussion. Early in the fair, one community member delivered stacks of new Post-it notes to keep the momentum going. The entire experience was one that touched the men and women of the Kansas Highway Patrol, and the greater law enforcement community. Men and women, girls and boys, people of all ages came to the booth to deliver their messages of support. The kind words left on the notes were not taken for granted, and left such a positive impact that each and every note was saved. 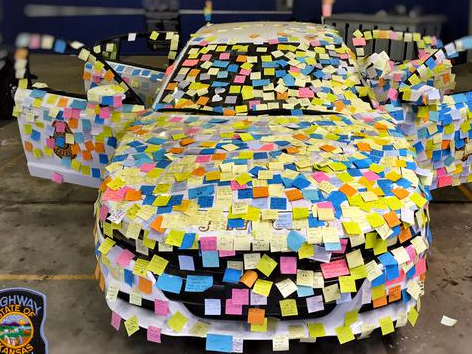 A photo of the car covered in notes was framed with the notes surrounding it, one for each of the Patrol’s seven field troop offices across the state. These will be displayed in the offices, a reminder of the support from the public that we serve, and to help keep perspective for the duties handled every day. Several messages are also being scanned and saved for use with other projects. Officials with the patrol acknowledge the many acts of kindness to their personnel over the last few weeks, and noted a humble thank you for your kindness, acknowledgment, and support. We are fortunate to serve in a state, whose communities remind us every single day of the reasons why we chose to serve. Thank you!